A delegate walks past a BRICS logo ahead of the 10th BRICS Summit, in Sandton, South Africa, July 24, 2018. The BRICS Leaders' Summit that kicked off in South Africa's Johannesburg Wednesday offers a significant opportunity to ameliorate Turkey's ties with the association's countries, Brazil, Russia, India, China and South Africa – the top five emerging markets. The summit is expected to expand Turkey's economic diversity and deepen its commercial ties with member countries. In his capacity as the term president of the Organisation of Islamic Cooperation (OIC), President Recep Tayyip Erdoğan headed to Johannesburg to participate in a forum that focuses on "south-south cooperation" in the global economy. Ahead of his departure, Erdoğan addressed the press and highlighted that Turkey's participation in the summit is a great opportunity to further improve relations with all BRICS countries, adding that he will meet with the leaders of the attending countries and evaluate bilateral and regional ties from political and economic perspectives. "Turkey aims to cement its ties with BRICS members and other countries attending the summit," Erdoğan said and stressed that Turkey engages in collaboration with these countries in platforms like G20 and the United Nations. The president later drew attention to the significant roles the BRICS countries play in global trade and growth. The population of the BRICS countries account for approximately 43 percent of the global population and make up 27 percent of the global land mass. The trade of BRICS countries corresponds to 23 percent of the global trade, while the gross domestic production (GDP) in these countries make up more than half of the global economic growth. The BRICS countries produce one-third of the global industrial products and half of the agricultural produce. The foreign trade volume of Brazil, Russia, India, China and South Africa with the rest of the world was recorded at $5.9 trillion. Turkey's trade volume with BRICS countries in 2017 was calculated at $60.7 billion. The country's total exports to the five BRICS members was $7.3 billion, while its imports from these countries hit $53.4 billion. The 10th BRICS is organized under the theme "BRICS in Africa: Collaboration for Inclusive Growth and Shared Prosperity in the 4th Industrial Revolution." Erdoğan's participation in the summit will be the first high-level official contact between the BRICS and Turkey. As part of the visit, President Erdoğan is expected to hold bilateral talks with the leaders of the BRICS member countries and other invited countries, according to the statement. He is expected to hold bilateral talks with Russia's President Vladimir Putin, China's President Xi Jinping, India's Prime Minister Narendra Modi, Brazil's President Michel Temer and South Africa's President Cyril Ramaphosa. Talks during the summit will focus on future steps to be taken to improve bilateral trade and economic ties, more specifically trade in local currencies among the participating countries. The leaders attending the summit are also expected to exchange views on regional and global issues. The summit will also be attended by United Nations Secretary-General Antonio Guterres. Erdoğan is expected to meet with Guterres in Johannesburg, where the discussions will focus on irregular migration, as well as on Syria, Iraq and Cyprus. Erdoğan is accompanied by Treasury and Finance Minister Berat Albayrak. 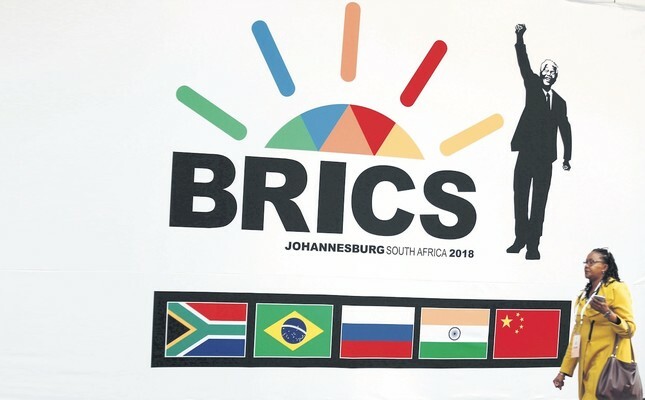 BRICS refers to a consultation and cooperation platform covering Brazil, Russia, India, China and the Republic of South Africa, which are defined as emerging markets. These five countries are G20 members, along with Turkey. "BRICS Plus" is a process launched by BRICS in 2017 to increase cooperation with non-member emerging markets and emerging countries, as well as international and regional organizations. Turkey's Ambassador to South Africa Elif Çomoğlu Ülgen praised the friendly relations between the two countries, ahead of the BRICS summit. "Turkey and South Africa go back a long way," she said, in an exclusive interview to Anadolu Agency (AA). "By joining the summit, our president will convey our views to other leaders and will have the opportunity to hold bilateral meetings with leaders of BRICS member countries," she said. Ülgen recalled that the two countries opened embassies in their capitals in 1993 and 1994 through mutual agreements. "Our bilateral trade volume is $2.5 billion. We buy minerals from South Africa. But there is a lot of untapped business potential. More needs to be done by South Africa." Ülgen pointed out that the internal dynamics of South Africa are well known, and so patience and care should be exercised when trading in the country. "Turkey invested in two companies in South Africa, appliance manufacturers and distributors Defy and Capetown Iron and Steel Works Company (Cisco). For better representation in South Africa, Turkey opened institutions such as TİKA [the Turkish International Cooperation and Coordination Agency], the Yunus Emre Institute and the Maarif Foundation," she added. Ülgen said that South Africa's relations with Turkey go way back to the Ottoman era. Renowned Ottoman scholar Abu Bakr Effendi was sent to the Cape of Good Hope in 1862 during the reign of Sultan Abdülaziz. His traditions are still being followed by Muslims in South Africa.